I really wish they got rid of the TCH and 68 Street NE intersection... I don't know if that will ever happen though. Meanwhile, the first intersection of the Regina Bypass is expected to open sometime next week; early and on budget. 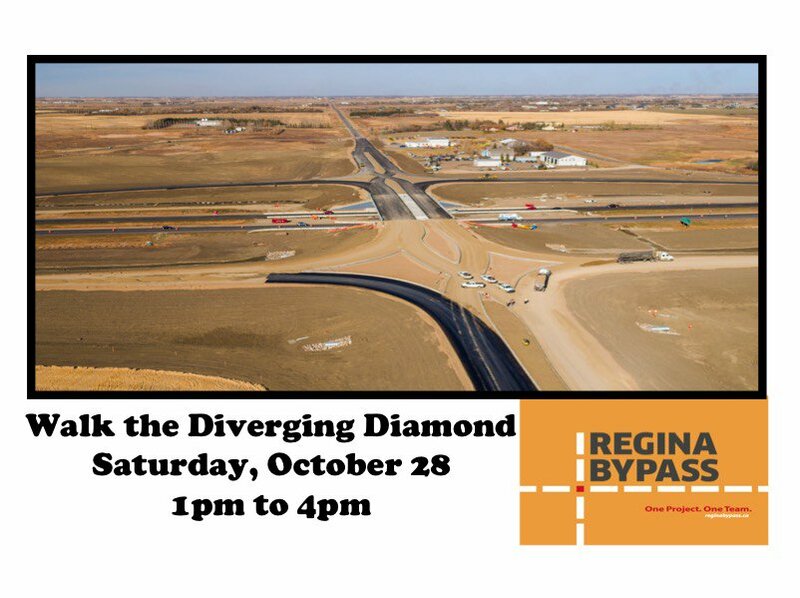 The Balgonie (SK 46) crossing is a dog-bone diamond interchange (diamond with roundabouts). It is the most eastern interchange on the Regina Bypass. Highway 1 east of Regina to just past the Balgonie crossing should be mostly, if not completely, grade separated once the Pilot Butte interchange goes in next year. Unfortunately the TCH is under City of Calgary jurisdiction and 68 Street NE is lower priority, so while there are plans on the books, it will be a while that comes into fruition. Just to the east of Stoney Trail, there is a set of lights at 100 Street NE; however, that is in Rocky View County so it's provincial. With the Bowfort Road interchange only being constructed now, barring some provincial or federal funding it will be a while. Personally, I would like to see the TCH follow Glenmore Trail through Calgary, incidentally Glenmore is now free-flow in the same area where 16 Ave N (TCH 1) has the majority of its traffic signals - between Barlow Trail and Sarcee Trail. It's not interstate standard, but a 80 km/h urban freeway is a lot better than a 50 km/h arterial street with traffic signals every 2-3 blocks (Stoney Trail could still function as the bypass). The new interchange (SPUI) at TCH 1 & Bowfort Road in Calgary is now officially opened - http://globalnews.ca/news/3706937/city-officials-set-to-celebrate-official-opening-of-trans-canada-highwaybowfort-road-interchange-thursday/. And on a more tragic note, more lives lost at the TCH 1 & 16 intersection near Portage La Prairie - http://globalnews.ca/video/3686666/small-manitoba-town-mourning-devastating-loss-of-father-and-2-young-sons. I've been waiting for confirmation that this project was complete. I knew it was supposed to be done soon, but wasn't sure exactly when. Now if only someone could fix it on Google Maps... it has it as an at-grade crossing. TCH should be marked freeway I think to east of Sarcee as well. I reported it to Google but have not received any sort of response. One thing though: was there an exit number assigned to this new interchange? (I doubt it but wanted to be sure). I haven't been out there to check it out, but I suspect no. The Sarcee Trail, located just east Bowfort Road and the true east end of the freeway, is being reconstructed and had new gantries install, does not have an exit number. TCH 1 between Calgary and BC would get an "incomplete" grade when it comes to exit numbers. Only the section maintained by Alberta Transportation currently have exit numbers, so western segment in Calgary (maintained by the city) and within Banff National Park, do not. Considering that Yellowhead Trail (TCH 16) is maintained by the City of Edmonton and has exit numbers, exit numbers on TCH 1 west should be added. Edit: Went out to Banff this weekend, not all the signage is up yet but so far, no exit number. who as put on hold. A couple videos on the Regina Bypass courtesy of the construction team. It appears that the new (mostly freeway) bypass will become the new Highway 1 through Regina. Unfortunately, the new Sarcee\1 interchange will have a traffic light to access 34th Ave. But the TCH following Sarcee/Glenmore (renumbered as 1) would still be better. Has that ever been considered? Technically, Sarcee Trail-WB 16 Ave traffic would avoid the light, but point taken. IMO, there should have been a 2 lane flyover constructed connecting NB Sarcee Trail to WB 16 Ave. I think with the focus shifted to the future West Ring Road (Stoney Trail between Glenmore Trail & 16 Ave NW), maybe that explains it. I don't think Glenmore Trail has been studied as an alternate alignment since the 1960s; one major challenge is the the Glenmore Reservoir is a drinking water source, so Class 6 Dangerous Goods are prohibited over the Glenmore Causeway. Saying that, I'm curious how Class 6 Dangerous Goods will be handled where Tsuut'ina Trail (Hwy 201) crosses the Elbow River upstream from the reservoir. If TCH 1 was realigned, Stoney Trail could function as the bypass. Other alignments were proposed, from a cancelled freeway a few blocks north of the current alignment in the 1960s, to an alignment that would follow Hwys 901 & 22X from Gliechen to Calgary and the follow the south and west perimeters - the latter being cancelled as it was too much of a bypass. A good read is https://calgaryringroad.wordpress.com/2013/01/24/the-trans-canada-highway-and-the-ring-road/. I believe it makes the Trans Canada freeway status from Tower Road to SK 10 east of Balgonie. It also looks like the new Bypass will carry the TCH designation (although Saskatchewan may decide to keep the current alignment also TC1, a similar thing happened in Saskatoon with the Yellowhead). Evidently the Pilot Butte diverging diamond interchange is not yet completed, though August 2017 imagery in Google Earth shows that the overpass is already in place (but not completed). I realized that after. Though it is very close to completion. Signs were erected a couple weeks ago and I still suspect they will open it at least partially this year (though not fully). If not, for sure by next summer. Looks like I was right. Part of the Pilot Butte interchange will open this Saturday. The rest of it will be done by next fall. Also, here is a drone video taken showing the interchanges. The new signs installed are also visible (Highway 1 is now rerouted along the new bypass). Looks like highway 1 will be rerouted over the bypass, at least once the bypass segment west of highway 33 to highway 1 is completed (scheduled for 2019). But I'm curious whether highway 1/TCH signage has been moved to highway 33 between the new bypass and the old route at Ring Road, or has been removed from Victoria Avenue and Ring Road north of highway 33. (The video shows no route signage for Victoria Avenue at its new exit from highway 1.) Maybe treat this as a reroute still in progress, but incomplete for the next few years? But I'm curious whether highway 1/TCH signage has been moved to highway 33 between the new bypass and the old route at Ring Road, or has been removed from Victoria Avenue and Ring Road north of highway 33. (The video shows no route signage for Victoria Avenue at its new exit from highway 1.) Maybe treat this as a reroute still in progress, but incomplete for the next few years? That's the million dollar question it seems. I guess we'll find out once the bypass is fully complete. I'm guessing Highway 1 will be completely rerouted to the new alignment. But, they could also do something like they did for Saskatoon with the Yellowhead; have two alignments, one for the north ring road, and one for the south. The opening of the first phase of the Regina Bypass caused a bit of mayhem on Arcola Street. Signs were posted indicating vehicles could use the bypass and avoid going through the city to get to Moose Jaw. However, when truck drivers went to use the road, they found out that part of the bypass wasn’t opened. Instead, they’d need to take Arcola Avenue and cut through Regina. I'm not surprised that happened. 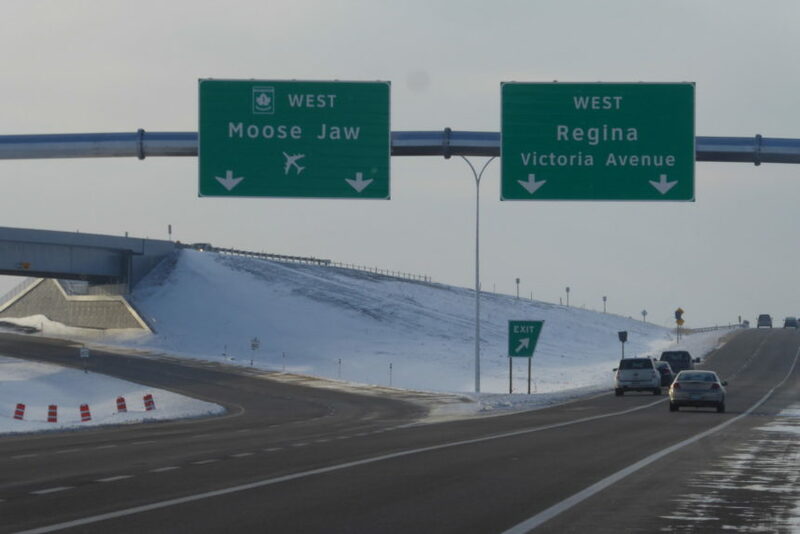 At this point, they ought to just cover up the "Moose Jaw" part of the sign until the bypass is open all the way to the existing TCH on the other side of town. Better still, temporarily cover up "Moose Jaw" with "To Arcola Ave", and add a "To" left of the TCH marker. The Regina Bypass project managers have indicated overhead signs will be changed to address motorist confusion, though I don't know how. Article about the Trans-Canada Highway between Kamloops and the Alberta border. Apart from those who call places like Revelstoke and Salmon Arm home, plus long-haul truckers, it is Calgarians for whom the mountainous stretch of the TCH is most vital. We are a wandering breed, and since our vacation compasses point west at a disproportionate rate, we have come to view the TCH as our road, our gateway to temperate climes, deep-snow skiing, lake life and, if we’re lucky, only occasional bouts of abject terror. Therefore, if you recently found yourself slowly traversing the construction-dotted TCH—or worse, suffering through one of its, on average, 64 unplanned closures per year—your heart may have skipped a beat upon spying the B.C. government signs trumpeting tax dollars at work in what reads like a latter-day miracle: "Kamloops to Alberta Four-laning Program." Seriously? Is this something that could actually occur in our lifetime? Spoiler alert: Be prepared to live a long time yet. I've heard about this. Considering it's 10-15 years down the road, we'll have to wait and see if anything happens with this. The Saskatchewan Government may want to build the new Saskatoon Freeway first. The construction of (one of?) the wildlife overpass(es) is complete. It is apparently the longest in the world. Can't tell much about the status of the twinning itself though. The 6 km section is supposed to be complete sometime this Spring. The Alberta government is looking to twin the Peace River bridge in the town of Peace River. I found this film that was done when the current highway bridge was opened in 1968. Previous to the present highway bridge, automobile traffic used the railway bridge, which is still in service. The second DDI in Canada opened this weekend in Pilot Butte SK (east of Regina). The video below includes a timelapse drive of the new interchange. Signage is consistent with US DDI's. This interchange is part of the Regina Bypass. It opened 20 months early. Construction is supposedly supposed to start next year.